When & How Do I Get My Child To Start Playing Golf, The Right Way? Boy, do I get asked this question often! After a few minutes, one of three consistent rationales usually emerge. Some parents have their minds set on college scholarships to help combat the skyrocketing cost of a degree. 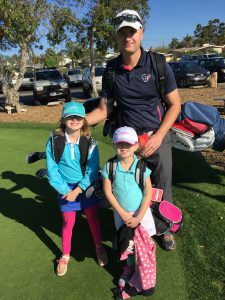 Others want to return to the course and hope that they'll be able to combine family time with golf. While still others just want their kids exposed to a great game for life that can be valuable to careers and social networking. Whatever the reason, I have seen many parents and kids come and go over my thirty-years teaching career and I wonder what the heck happened to them? I believe that whatever the reason was to get them started, it wasn't enough motivation to go through a process that seems overwhelming at first, BUT DOES NOT HAVE TO BE AT ALL. When Tiger Woods legendary father Earl was asked, "When should I get my kid into golf? ", his answer was always, "When they ask!" As long as you keep it fun and they want to be there, you got em! Here's a few pieces of advice I have picked up over the years that may help. Rule #1: Don't be a Parent, Be a Fellow Golfer. Most kids are pretty smart and deserve our respect. Just because they're young and small, I always listen to them to see what they are thinking. Be sure to do the same thing as a parent. Rule #2: Start close and move back when able. Always start with putting by placing the ball very close to the hole so they can tap it in and see the ball being holed...the visual and sound is amazing even to a kid! Move back from the hole as they are ready. Rule #3: Don't get caught up on a perfect grip. When they are just beginning, kids do not have to have the perfect grip and if you start to "tell them what to do" like a parent, they'll often reject the advice and it kills the fun. Rule #4: Teach them etiquette but let them be kids. You don't want to disrupt others at the course, but you can still enjoy the outside and let kids be kids as much as possible. Rule #5: You can hold off on lessons for a while. They do NOT need lessons so early! Teach or show them how to putt and chip without a hole much direction and they will figure it out! Golden Rule: Keep it fun. Keep smiling and reward them for coming out to the golf course with you and having fun as a family. Make it a special time of love and sharing a gift...the game of golf!